The Mets enter camp this spring with just one left-handed reliever expected to make the Opening Day roster in 28-year old Josh Edgin. Sandy Alderson and company are unlikely to change that despite several established left-handed relievers still hanging around on the free agent market such as Phil Coke or Joe Beimel. The Mets are unlikely to sign either one of them, even to a minor league deal at this point which means expect Terry Collins to call on “Everyday Edgin” frequently to start the season. The Mets have a very good bullpen but the one Achilles heel of the group is having just the one lefty. Not to mention that one lefty is Edgin, who is promising, but hasn’t established that he can handle the workload that is going to be asked of him. In fact few have. The Mets have tried the one lefty thing before in recent seasons with players such as Pedro Feliciano, Tim Byrdak and Scott Rice. All three players had early success before being ran into the ground from overuse. The same thing is going to happen to Edgin unless the Mets find a second pitcher to get left-handers out. Edgin has never exceeded 30 innings a year in parts of three seasons in the big leagues and has never pitched in more than 47 games. The Mets are hoping Edgin can nearly double his appearance workload this season just like the days that “Perpetual Pedro” got in 90+ appearances a year for the Mets a few seasons back. Feliciano led the league in appearances every season from 2008-2010 and has pitched in just 11.1 innings since. The Mets have rule 5 pick LHP Sean Gilmartin in camp but the team sees him more as a long-man than a lefty specialist. 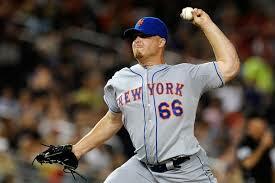 Plus with Dillon Gee still in camp as the long reliever it is unlikely Gilmartin will find a spot on this club. The Mets also have Jack Leathersich but he isn’t quite ready for big league action just yet according to Sandy Alderson. This could emerge as a problem early on in the season so stay tuned…. The Mets have signed Bobby Abreu to a minor-league deal. Abreu will report to Triple-A Las Vegas. The Mets liked Abreu a lot this winter with his high OBP despite his advanced age. We wrote about the Mets interest in Abreu this off season here. 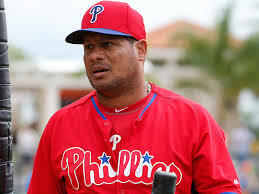 Abreu didn’t make the Phillies roster and was granted his release. This doesn’t make a lot of sense to me. Abreu really shouldn’t be playing the foutield anymore and the Mets already have three first base only players on their roster. Adding a DH only like Abreu can’t help Terry Collins’ roster flexibility. Abreu, 40, last played in the majors in 2012 with the Dodgers and hasn’t been a big league regular since 2011 with the LA Angels. When Omar Quintanilla and Wilfredo Tovar arrived in Port. St. Lucie this weekend it officially meant all 64 Mets who were invited to big league camp made it on time. 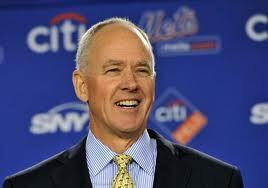 With that, it is officially time for the 2013-2014 Mets offseason in review. Obviously the Mets added talent to a very bad Met outfield with the additions of Granderson and Young but the two were both overpayed. Granderson missed most of the 2013 season with multiple stints on the disabled lists while Young hit .200 and lost his job by the end of the year. Plus the Mets stuck out a ton last year and even if Granderson and Young improve their numbers they are both strikeout prone. The Mets are going to strikeout a lot next year. Granderson should have gotten a two-year deal, maybe three but four years was just too much. Nobody was obviously going to match them but when you have been bad for as long as the Mets have been, sometimes you have to overpay to get a guy to come here. The Grandy Man should still bring some much needed pop and lineup support to David Wright but this is still a below average offense in the National League. The Mets outfield defense however should be up there with the best in the game. Bartolo Colon is a “Sandy Aldersonish” signing because he brings upside. Colon was outstanding last year and if he could repeat his 2013 Oakland numbers than the Mets could compete for a playoff spot. However he is coming off his second year with a steroid scandal, he’s over 40 years old and is extremely overweight. Most importantly he throws his fastball over 85% of the time so if he loses another tick or two off of it, this could prove to be a disastrous signing. Colon told reporters in Spring Training that the Mets were the only team to give him a two-year deal. I still like the deal compared to what similar pitchers got on the open market. Lannan is a nice minor-league signing who will provide depth and will compete for the 5th spot in the Mets rotation. Terry Collins also said he could come out of the pen to face lefties but he has never done that before and I would call it unlikely. The Mets never found their shortstop and never figured out what to do at first base. Instead, they elected to just hope one of Ike Davis or Lucas Duda can make the decision they have put off for years a little easier. Ideally one of Jose Valverde or Kyle Farnsworth can be rejuvenated in spacious CitiField and help create the bridge to Bobby Parnell. The Mets didn’t lose much in free agency. Hawkins was great last year but he’s 40 years old and can be replaced. Justin Turner was a fan favorite but the front office wasn’t thrilled with his “lack of hustle”. Obviously the biggest lost this winter was losing Matt Harvey for the season. If I was grading the Mets offseason I would give it a C. I really liked the Colon signing because he has the most upside of anyone the Mets could afford. However I felt the outfield could have been fixed much cheaper which would have given them more money to acquire a shortstop, a hole that is still present. Nelson Cruz signed with the Orioles over the weekend on a one-year $8 million deal. Cruz to me has a lot more upside than Granderson and or Young but that’s my opinion. The Mets had a very bad bullpen last year and didn’t do much to fix it other than a few minor-league deals. Finally, Sandy Alderson and his staff have had years to determine what to do with the Duda/Davis dilemma and have still not answered that question. However it was nice to see them acquire some new players for the first time in the Alderson era. Those are the reasons they get a C.
What grade would you give the Mets offseason? The Mets have announced that they have signed right-handed reliever Jose Valverde to a minor-league deal with an invitation to spring training. Valverde should arrive in Port St. Lucie in the next couple of days. Valverde, 35, posted a 3.00 ERA and 110 saves for the Tigers from 2010-12. 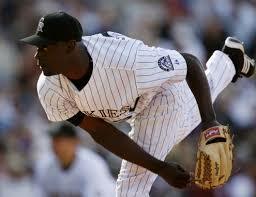 Valverde has 296 saves in his big league career across 10 seasons. However, he began to unravel late in the 2012 season and in the 2012 playoffs. He would eventually return to Detroit in May 2013, briefly solidifying the closer role before allowing six home runs in eight appearances. The end result was a 5.59 ERA that caused the Tigers to designate Valverde for assignment. The Mets had serious interest in Valverde last offseason, but at the time he wanted a major-league deal. The Mets were unwilling to give him that deal. Valverde is still young enough to bounce back but his issue has been fastball velocity. Valverde makes a lot of mistakes in the zone, especially to left-handed hitters with his breaking pitches. However he was always able to throw 96mph so it prevented hitters from looking strictly for his off speed pitches. The last couple of seasons Valverde’s velocity has been down and if that continues with the Mets, there is no reason to think he will have success. If his velocity is decent, he can be a dynamic set-up man in the Mets very inexperienced bullpen. Valverde will earn $1 million if he makes the team plus can earn another $1.5 million in incentives. Many of the relievers that have been linked to the Mets this offseason have signed elsewhere in the past few days. 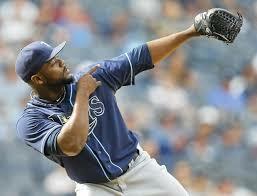 The Mets were very interested in former Rays closer Fernando Rodney who signed with the Seattle Mariners Thursday. 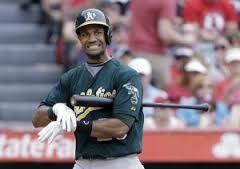 Rodney received two years and $14 million, far more than the Mets were willing to offer. The Mets had also been linked to former Cardinal set-up man Mitchell Boggs. Boggs, 29, badly struggled in 2013 after a dominant 2012. The Mets liked him a lot but were only willing to give the right-hander a minor-league deal. The White Sox signed Boggs Friday to a major-league deal worth $1.1 million. Former Met Luis Ayala had a very strong year for the rival Braves last season and I speculated that he could become good insurance for Bobby Parnell. Well that will not happen now as Ayala signed the Washington Nationals. Despite his very strong 2013 season, Ayala only got a minor league deal with the Nats. Don’t panic Mets fans there are still plenty of relief options available. Former Pirate and Red Sox Joel Hanrahan is throwing a light bullpen session today and his agent Mike Dillon has confirmed that the Mets were in attendance. Hanrahan underwent Tommy John in May so he likely will not be ready before the season starts. He doesn’t plan on signing until he’s 100% which won’t be until at least March. This sounds a lot like the Mets interest in Brian Wilson last offseason. Wilson didn’t sign until mid season but had a dominant stretch run with the LA Dodgers. Our old friend K-Rod resigned with the Brewers today, but the Mets didn’t seem to have a ton of interest in reuniting with him. Who should the Mets bring in for their bullpen? The Mets have signed RHP Kyle Farnsworth to a minor-league deal with an invitation to Spring Training. 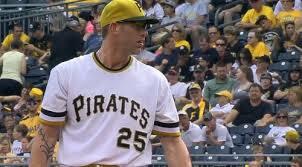 Farnsworth, 37, split time between the Rays and the Pirates last season. Farnsworth went 3-1 with a 4.70 ERA in 38 innings in 2013. His last really strong year came in 2011 as the Rays closer but there isn’t much risk in this move for the Mets. If Farnsworth is good in Spring Training then he will make the team and could be a nice veteran piece for the bullpen. If he is no good then the Mets can just cut without much cost. The Mets bullpen is incredibly young so having an older player like Farnsworth to compete for a spot could be very good for the Mets inexperienced arms. This strategy seemed to work out well for the Mets last winter when they brought in LaTroy Hawkins on a minor-league deal to compete for a spot. Hawkins finished the year as the Mets closer. The Mets have been looking for a closer type reliever and from what I can gather this signing doesn’t mean they are done looking for relief help. 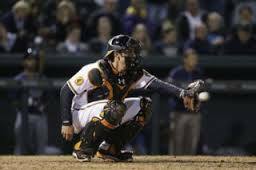 The Mets have announced that they have signed catcher Taylor Teagarden to a minor league deal with an invitation to Spring Training. Teagarden, 30, has played for the Orioles and Rangers throughout his career as a backup. He will go to Spring Training with the Mets and will compete with Anthony Recker to determine who will be the Mets backup catcher. Teagarden hit .167 with two homers in 62 plate appearances in Baltimore last season. The loser of the backup catcher battle will probably go to Triple AAA Las Vegas and split time behind the plate with Juan Centeno.